What is cosmology? : Cosmology is the study of the origin and evolution of the Universe, including its contents, dynamics and future. Of course, as there is only one universe available to us, we can’t just take it down to the lab and run experiments on it; instead, we must rely on observation. Olbers’ Paradox: Our most basic observation is that the sky is dark at night- yet in an infinite, homogeneous, static universe, with n stars per unit volume (neglecting absorption), we expect to see a total flux from the Universe. Cosmic Microwave Background (CMB): a(n almost) uniform background glow. In the past, the universe was hot enough that everywhere was ionised, and all space was one photosphere. Since then, expansion has caused that radiation to be red-shifted to a lower characteristic temperature of 2.7K. So in fact, the night sky is glowing with uniform brightness- only it is in the microwave spectrum rather than the visible. Dipole anisotropy: anisotropy in the CMB arising from the absolute space velocity, v, of the Earth. COBE (Cosmic Microwave Background Explorer) satellite measured v=371±km s-1, giving ∆T~3mK in each direction. Consequences of the Earth’s motion: temperature is boosted due to the motion of the observer with respect to the CMB, but the thermal spectrum is retained. Recombination and decoupling: after the Big Bang, temperatures were sufficiently high enough that matter was fully ionised. Thomson scattering was highly efficient, and the universe was in thermal equilibrium. As the universe expanded and cooled, however, it reached a temperature where electrons and protons could combine to form atoms (recombination). Once neutral hydrogen was formed, the universe became transparent to CMB photons. Matter and radiation effectively evolved separately from there (decoupling). Epoch of last scattering is when a typical CMB photon underwent its last scattering from an electron. Surface of last scattering: the radiation we see as the CMB appears to come from a spherical surface around the observer such that the radius of the shell is the distance each photon has travelled since it was last scattered at (or after) the epoch of decoupling. This is the surface of last scattering. 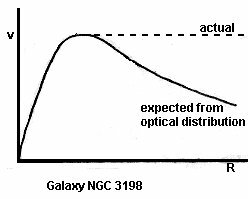 The surface of last scattering as seen by observers in, say, two different galaxies has the same radius, but they are not the same surface. Anisotropies in the CMB: the dipole anisotropy is due to the Earth’s motion through space, but higher order anisotropies are properties of the CMB itself, and should tell us about the precursors of the structures (e.g. galaxies) that we see today. Cold spots correspond to overdensities (seeds of clusters and superclusters). Hot spots correspond to underdensities (seeds of giant voids). These perturbations have effect over large angular scales (≥3 degrees). Intrinsic/Adiabatic perturbations: high density regions will be at a higher temperature. Those denser regions recombine later, so they are less redshifted and appear hotter. Has effect over angular scales of 0.1-1°. Doppler perturbations: at recombination, the plasma has non-zero velocity, leading to Doppler shifts in frequency and hence temperature. These have an effect on the smallest angular scales. Angular power spectrum quantifies the amplitude (al2) of temperature fluctuations on different angular scales. Cosmic variance affects measurements at low l. No matter how precisely we make our measurements, there is still a large uncertainty. Out angular scale is large at low l, and with only 4π of sky available, there is not much scope to make measurements. If the universe is flare, power spectrum images will be dominated by hot and cold spots of ~1 degree in size. If the universe is closed, parallel lines converge, thus images will be magnified by the curvature and structure will appear larger than 1 degree. If the universe is open, parallel lines diverge and images will appear smaller. Spectrum of primordial sound: temperature variations can be regarded as sound waves in primordial plasma. The angular power spectrum of these images reveals the characteristic scale which dominates them. This physical scale is determined by the product of the sound speed at this time and the age of the universe. The angle that this subtends on the sky will depend on how curved space-time is; the more open the universe, the smaller the angle that will be subtended, leading to an acoustic peak at higher l.
Homogeneity and history: CMB irregularities are on the order of (equivalent to a swimming pool whose largest ripples are only a hundredth of a millimetre high). The CMB tells us about decoupling when the universe was ~105 years old, and the scale of these irregularities indicates that it was a mostly homogeneous place. Even so, the current universe is a lot ‘lumpier’, with stars clustered together in galaxies- we need to qualify what happened between then and now to change it. Gravitational Instabilities: after considering the above, we conclude that structures in the universe evolve through gravitational instability, using the following reasoning. Start by invoking a long range force, i.e. gravity. If there are small irregularities in the distribution of matter at decoupling, the regions with the highest density will tend to attract matter from the surrounding regions, making them denser still. Therefore, an irregular distribution of matter is unstable under gravity, which is why the universe is no longer the homogeneous place it was at decoupling. ‘Younger’ galaxy (stars ~108 years old) shows strong Balmer absorption lines of hydrogen. Older galaxy has C, N. Mg and Ca lines, with an abrupt falloff at 4000 angstroms. The brightness of discs of spirals, SO and many irregular galaxies is reasonably well described by an exponential disc. where r0 is the scale length. where H0 is known as Hubble’s constant. 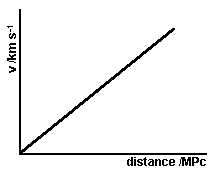 Distance is determined from luminosity. Fainter objects (presumably more distant) appear to have higher redshift. Theory suggests it should be 72, but because it is quite difficult to get accurate values of d, H0 still needs calibrating. Hubble’s Law represents the expansion of the universe (more on this later). Hubble flow describes the general recession of galaxies on scales greater than tens of megaparsecs. On smaller scales, other mechanisms are at work; for example, the Andromeda galaxy is actually moving towards us. Expansion of the universe: at this point, it helps to define exactly what is expanding; in a cosmological context, we mean the separation between galaxies. As we will see later, even if everything appears to be moving away from where we are, that does not mean that we are the centre of the expansion. In fact, we do not even have to invoke a centre of expansion at all. a(t) is called the scale factor; basically a time dependent magnification factor. A given volume of coordinate space always contains the same number of galaxies, so . a at t=’now’ is called a0 and is usually taken to have a value of 1. 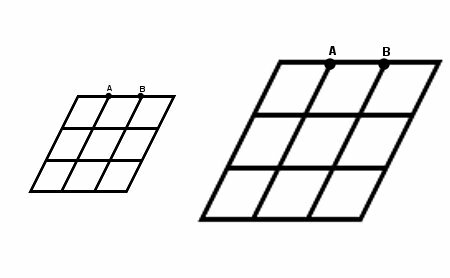 A and B get further apart in space, but they are always separated by one grid length. This is Hubble’s Parameter- what we quoted earlier was Hubble’s Constant H0, which is Hubble’s Parameter at t=”now”. H is a constant in space but not in time- H would decrease in time due to the gravitational attraction of matter in the universe. Masses of spiral galaxies: consider a star orbiting around the centre of galaxy at a distance R from the centre, and assume that the galaxy has mass M(R) within radius R. Equate gravitational acceleration with centripetal acceleration. We would expect this behaviour for stars as a function of R.
(Note: rotational velocities beyond the visible part of the galactic disc are obtained by measuring the Doppler Shifts in the 21 cm hydrogen emission line. Orbital velocities are not proportional to , but instead seem to be a constant out to the largest radii. It seems that luminous matter is not the only thing making a contribution to M(R)- the measured velocities imply that there is ten times as much matter as is directly seen. This is dark matter. Of course, our basic assumption is that the laws of physics apply on these scales.